Saturday February 1st 1902 We were surprised this morning to know that Dell had in the night slipped his things out of the house and gone. Will had just more than he could do so he got Mort Hoffman to go down for the folks. I had a nice dinner and did so enjoy having them here for the day. weather turned very much colder tongiht. Sunday February 2nd 1902 it was an intensely cold day. Will was busy about the work all forenoon. He got a young man to come to work tonight. We read all our spare time. Frank brought Mollie back about four oclock. I wrote fo Vene in the forenoon. 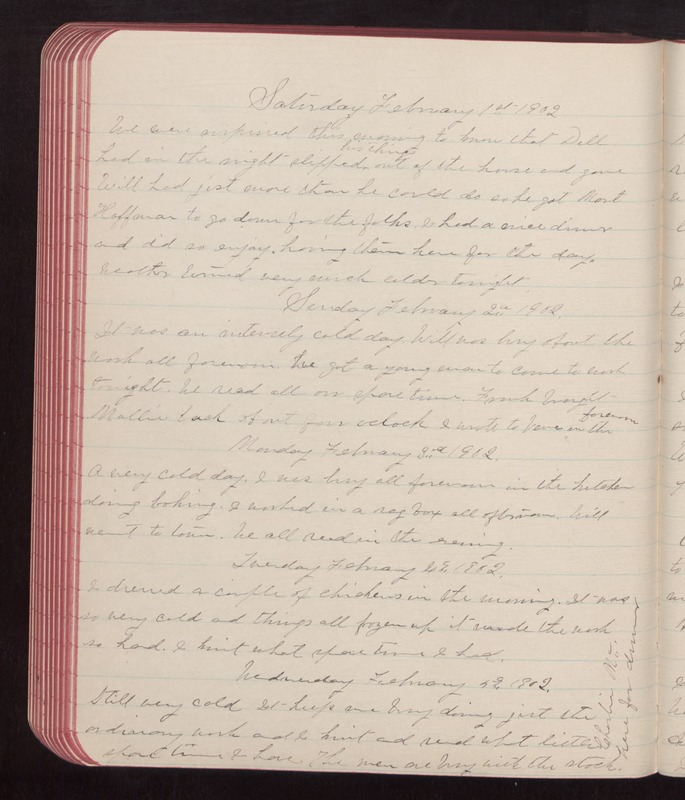 Monday February 3rd 1902 A very cold day. I was busy all forenoon in the kitchen doing baking. I worked in the rag box all afternoon. Will went to town. We all read in the evening. Tuesday February 4th 1902 I dressed a couple of chickens in the morning. It was so very cold and things all frozen up it made the work so hard. I knit what spare time I had. Wednesday February 5th 1902 Still very cold. It keps me busy doing jist the ordinary work and I knit and read what little spare time I have. The men are very busy with the stock. Charlie Mc here for dinner.